A group that helps people write and publish books, The Dancing Pencils Writing Club, has encouraged people especially in rural areas and in various government facilities such as hospitals, prisons and schools to open writing clubs and write their own stories. 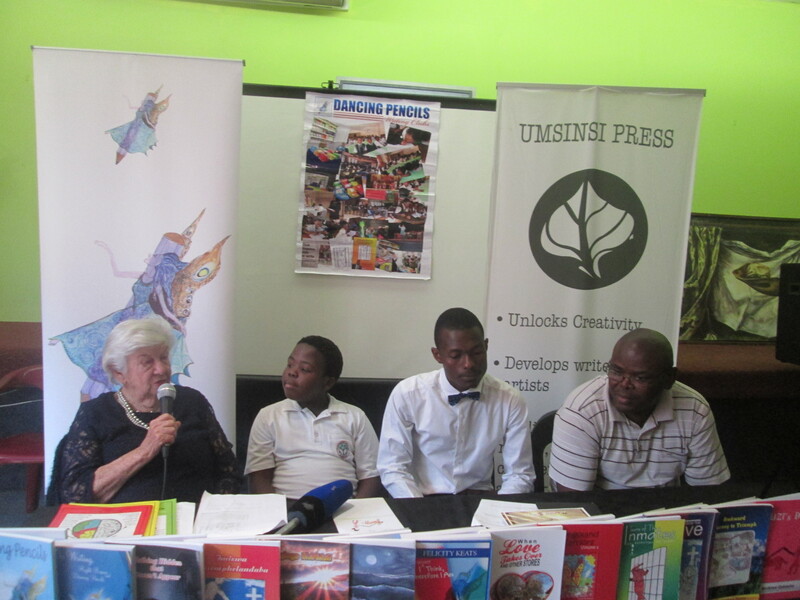 The club had a media briefing to detail its latest 300 new book titles in Durban. The club believes that the reading and writing training provided by the club could help learners improve their marks at schools especially on subjects such as maths, science and literacy. picture: Felicity Keats Morrison (founder), Sinikiwe Gcabashe (Kid author of Suzi’s Dog, 8 years old), Ayanda Hlabisa (memntor and publicist), Philani Nzuza (ex-offender and author of Awkward Journey) Dancing Pencils Panel at the SABC Radio News Media Briefing at BAT Centre earlier this week. The Dancing Pencils Writing Club believes the answer to improve pass mark for learner’s lies in expansive right brain training’s provided by the club mentors. Authors are ranging from prisoners, scholars, cooperatives women and others. Most of the writers say reading and writing can be therapeutic and discourage people from participating in social ills as it encourages the power of positive thinking. Philani Nzuza one of the authors, an ex-offender from Westville Maximum Security section says he used to bear grudges and animosity against everyone especially those who landed him in prison in 2013. But after he was introduced to the writing club operating in Westville prison, the writing training served as therapy. While in prison Nzuza has written a short story in the anthology “Stories from the Grave” and a poem “Tears of the Inmates” and now after his parole he published the new title ‘Awkward Journey to Triumph’. Holding his books, Nzuza says writing helped him a lot to deal with his past. I have been to Westville prison from 2011 to 2014 – that’s where I met the dancing pencils – i did not want anything to do with anything from outside, but when i listened on how to use the right brain i listened to them I actually happened to be using the right brain by just listening to them. It helped me a lot to get my anger out that I had back then. Founder of the Dancing Pencils Felicity Keats says the right side of the brain encourages the ability to follow one’s dreams and to achieve success. She says they have clubs in many areas such as Kosi Bay, Mkuze, Paul Pietersberg, Vryheid, Nkandla, Empangeni, Dundee, Ladysmith, and Newcastle to districts on the south coast. We run these writing clubs under mentors – we trained to use the right brain because its non – judgmental – non critical – we provide a safe environment for young people to test out their ideas without criticism and out of that they produce publishable work very quickly – once a year we do annual book launches – they write about their own problems what matters to them, in rural areas, poverty, abuse, unwanted pregnancies and their dreams on what they want to do with their lives and produce stories. One of the Mentors, Ayanda Hlabisa has encouraged municipalities to come on board and assist in funding the clubs in their districts. Hlabisa believes the writing clubs help eliminate anti social behavior from the youngsters as they direct their energies to do positive things. These clubs believe anyone can be an author whether they are academically literate or not. Many authors are rural women who tell their stories through the word of mouth before their ideas are written on paper. They believe they find growth in their brain’s ability to broaden view and to discover new truths which include leading a better life. These writers have become good role models for their peers.